Now I just want to say that judging by the amount of vampires I saw on Halloween the other night, and the amount of vampire films to come out recently I think he could get off on a hung jury or possible mistrial, or trail if you will. That being said when Halloween lights off and my son went to bed I decided to throw Trial of Dracula on as I’ve always enjoyed the character and I was in the mood for horror, but not a horror movie. Trail of Dracula is a short documentary. It clocks about 1 hour and tells the history of Count Dracula. 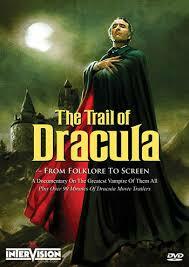 It actually goes further back beyond the legend of Vlad the Impailer, the character Count Dracula is based off of. You learn about Nosferatu, who I always found rather lame and of course you delve into Bram Strokers classic novel. As I always hated the book, and the big budget film that came out I was not overly excited to say the least. In fact I was a bit bored as even though I love Vampire movies the lore dating back is not really a fascinating subject to me. Luckily the director realized this and the second act of the doc really picks up for us fans who are only about horror. We get to explore the history of Dracula in film. From Bela Lugosi, to Christopher lee its all explored. Universal clips, which are my favorites as my son and I are both huge Universal Monster fans to the hammer Films from England, which are loved and admired by most all the horror population. One of the cool things is learning a bit about the film Satanic Rites of Dracula, which I recently reviewed and hearing about the last Hammer Dracula film. We also get to hear Werner Herzog discuss his Nosferatu, Udo Keir discussed Blood for Dracula, and of course audio of Christopher Lee discussing his love of Dracula. Now if you’re a Dracula movie fan get ready for this. There are 43, yes 43 different trailers for Dracula films from all over the world on here. That’s over 90min of Dracula Trail Goodness. That alone if enough reason to buy. And I have to say the video quality on this disc is very good considering they had to mix many types of footage together. If you like Dracula, or Vampires, or if you are just a fan of horror films then there is something on here for everyone. A detailed documentary and a plethora of trailers. Sadly though I did not see a trailer for “Trial of Dracula” so I think I may have to start production on that one.